As I move to our front hall I find stashes of gloves and winter hats. 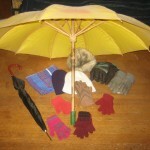 I also counted seven umbrellas (plus one we keep in the car). 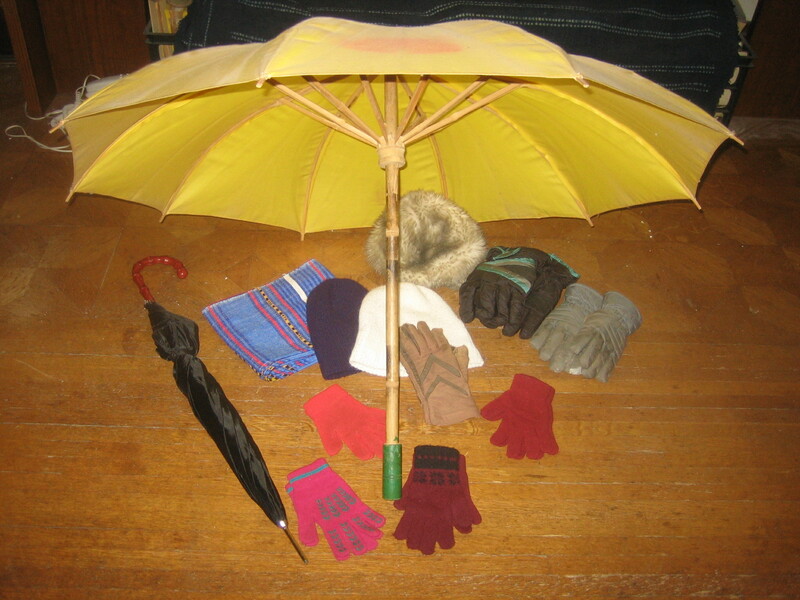 Even allowing for visitors who may need an emergency umbrella, gloves, or hat, we don’t really need all of these. How many people are really going to visit us in January, gloveless and hatless? Would seven people without umbrellas really descend on us in one fell swoop? Out! Out! #1 | Written by Scottie about 9 years ago. We took our first load to the Salvation Army yesterday. Even Jerry got in on the contributions–a guitar (he just bought a new one) a computer scanner and clothes. Thanks for the continuing inspiration. Our tons of hats scarves and gloves are in the same closet as the wealth of games. Like you we keep them for the grand kids but they don’t get here from Sicily and S. Korea that often–they’ll be out grown! It’s the memories that make it hard! We will purge for the sake of other children.